DVD Ripper Suite - rip your favorite DVD movies to popular DivX/Xvid AVI files, H.264 MP4 files DVD Ripper Suite was designed to be a DVD ripping tool that will help you rip your favorite DVD movies to popular DivX/Xvid AVI files, H.264 MP4 files, and even iPod MP4 video files with fast DVD ripping speed and excellent quality. 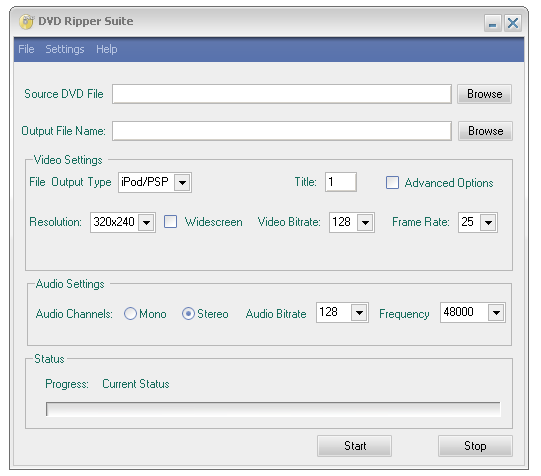 DVD Ripper Suite has a user-friendly interface and you can rip DVD with only a few clicks. Enjoy it! Can rip DVD movies and convert DVD to MPEG-4 DivX / Xvid AVI format. Can rip DVD movies and convert DVD to H.264 MP4 format for Apple TV, PSP. Can rip DVD movies and convert DVD to iPod MP4 format. Can rip both encrypted or unencrypted DVD movies. You can select DVD source from both hard drive and real DVD. You can select the titles and chapters to be ripped from DVD. You can select the audio tracks and subtitle tracks to be ripped from DVD. Set the output video resolution, video bitrate (up to 2500 kbps) and video framerate. Set the output audio channel, audio bitrate and audio frequency. Qweas is providing links to DVD Ripper Suite 1.5 as a courtesy, and makes no representations regarding DVD Ripper Suite or any other applications or any information related thereto. Any questions, complaints or claims regarding this application DVD Ripper Suite 1.5 must be directed to the appropriate software vendor. You may click the publisher link of DVD Ripper Suite on the top of this page to get more details about the vendor.